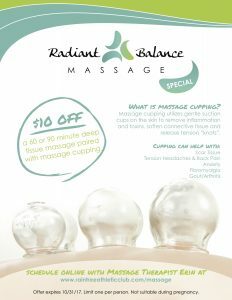 Radiant Balance Massage is now offering Massage Cupping! New Massage Therapist Erin Mader is offering a special promotion now through October 31, 2017! Receive $10 Off a 60 or 90 minute deep tissue massage paired with massage cupping. Massage cupping utilizes gentle suction cups on the skin to remove inflammation and toxins, soften connective tissue and release tension “knots”. Schedule online via MASSAGE BOOK with Erin. Offer expires 10/31/17. Limit 1/person. Not suitable during preganancy.